This work is licensed under a Creative Commons Attribution License. This copyright applies to the Gi2MO Ontology Specification and accompanying documentation in RDF. This ontology uses W3C's RDF technology, an open Web standard that can be freely used by anyone. Generic Idea and Innovation Management Ontology (Gi2MO) is a standardised data schema (also referred as "ontology" or "vocabulary") designed to annotate and describe resources gathered inside Idea Management facilities. The following document contains the description of ontology and instructions how to connect it with descriptions of other resources. 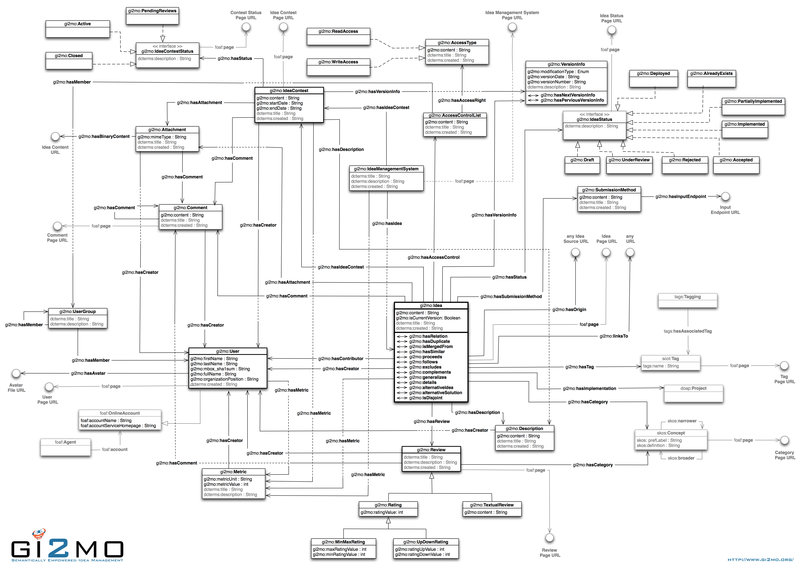 The following specification is a formal description of metadata schema proposal that can be applied to data gathered in the so-called Idea Management Systems. The goal of the following section is to introduce both Semantic Web and Idea Management experts to the topic and goals of the ontology and provide the basic knowledge to comprehend the technical part of the specification. An important note is that Gi2MO ontology is not a complete model of the Idea Management System. It marly defines concepts that are not described yet by the means of other ontologies. For detailed instructions how to completely model Idea Management Systems with Gi2MO and other ontologies see homepage of the Gi2MO project. The Idea Management Systems are referred most often as an application used by organisations to collect input about various ideas regarding their products and services; and manage them afterwards providing certain assessment and screening facilities. In relation to other IT systems used in modern organisations, at the time of writing this specification the Idea Management Systems have not been yet introduced as a standard component by the key players as part of their ERP, PLM/PLCM or CRM suites. Idea Management, in relation to those systems, is still being considered as a rising market and a complementary solution that can be supplied depending on organisation's interest in investment in innovation. One of the corner stores of the Semantic Web is research on inter-linkable and interoperable data schemas for information published online. Those schemas are often referred to as ontologies or vocabularies. In order to facilitate the concept of ontologies that lead to a truly interoperable Web of Data, W3C has proposed a series of technologies such as RDF and OWL. Gi2MO uses those technologies and the research that comes within to propose an ontology set in the domain of Idea Management. 1.3 What is Gi2MO for? For more information please refer to Gi2MO project website. Gi2MO Wave Ontology - an example of extending base Gi2MO ontology to suit a particular business model for IMS. The ontology includes new ways of idea categorisation and classification of idea review (e.g. market analyses etc.). eDialogos Consensus - an ontology for argumentation systems, joins Gi2MO concepts together with ontologies for problem solving. Aside of modelling a social environment for posting and discussing over ideas, the ontology adds the notion of idea consensus, where participants argument pros and cos of ideas and produce a single final version together. An alphabetical index of Gi2MO terms, by class (concepts) and by property (relationships, attributes), are given below. All the terms are hyperlinked to their detailed description for quick reference. 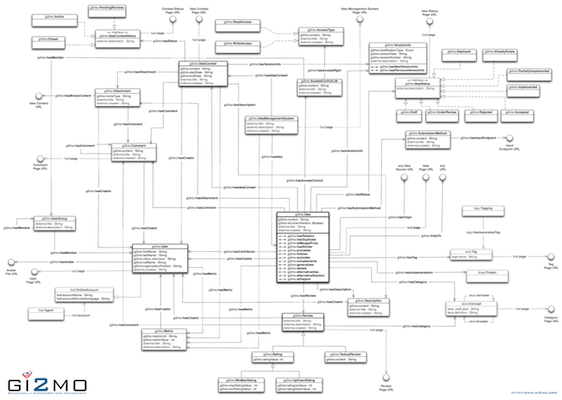 The Gi2MO UML diagram presented below shows connections between classes that implement the data model of Idea Management Systems. For more examples please see a Gi2MO RDF export for a simple Idea Management System instance installed on lab GSI severs. Below see a comprehensive list of all Gi2MO classes, properties and their descriptions. AccessControlList - An instance of this class indicates the access rights for particular users to a resource that it is connected to (e.g. write privilages for a given idea or idea contest). AccessType - Defines access type to a resouce. See class instances for possible options. Attachment - An instance of this class represents attachment of any entity in idea management system (e.g. image attachment to idea). Description - An instance of this class models any textual description that is added as a supplement to the basic textual content of an entitiy of an Idea Management system. For example this can be a special description of an idea (e.g. Beneficiaries described seperatly from the idea summary). Idea - An instance of this class represents a single idea stored in the Idea Management system. IdeaContest - An instance of this class represents the so-called Idea Contests (also referred as "idea campaign", "idea event" etc.). Idea contests are events that stimulate idea submission, bind ideas tematically and attach their collection to a particular time period. IdeaContestStatus - An instance of this class describes status of idea contest. For a list of recommended instances of this class see the individuals list associated to this class in the ontology definition. IdeaManagementSystem - An instance of this class represents an Idea Management Systems as a container for knowledge associated to the Idea Management process. The class modells the relationships that the systems has with it's data. IdeaStatus - An instance of this class describes status that idea and indicates the position of the idea in the Idea Management life cycle (e.g. Draft, Implemented, Deployed etc.) For a list of recommended instances of this class see the individuals list associated to this class in the ontology definition. Metric - This class models any metrics related to Ideas. For exampe Idea Deployment metrics (Revenue, ROI etc.) or any other metrics associated to the idea as it progresses across the idea pipeline (idea implementation cost, idea assessment costs etc.) The metric can be associated with an individual Idea or an Idea contest. MinMaxRating - An instance of this class describes a rating where users giving votes have to select a value from a predefined scale (for example 1..10). Rating - An instance of this class describes a numberical rating attached to the idea. E.g. star review or a quantified reivew. Review - An instance of this class indentifies review of a idea. This can be, a textual review, a rating or any kind of assessment made by a number people (e.g. star reviews done by users but also idea assessment made by internal company reviewers). The instance of this class can be used both to describe a single review action (connected to a user thus having hasCreator property) or a global review summary (e.g. description summerizion all votes and combined rating value). If not sufficient is recommended to extend this class via inheritace mechanism and add additional type of idea assessment that is particular for a given implementation of Idea Management System. SubmissionMethod - An instance of this describes an input interface (e.g. device or software) that was used to submit an idea. This class can be used for Idea Management systems that have many data entry points, for example web forms, collaborative tools, mobile device access etc. Also this class can be used to interlink detailed input information encoded via other ontologies through rdfs:seeAlso (e.g. operating system, browser, screen size etc. can be expressed in DCCI Ontology). TextualReview - An instance of this class models a textual review of any kind attached to the idea. UpDownRating - An instance of this class describes a rating type where users only vote up or down, without any particular grading scale. In case of modeling a single vote ratingValue can be set to 1 or -1. User - An instance of this class models a user account in the Idea Management system. User types can be defined by creating UserGroups. UserGroup - An instance of this class allows to group users to reflect the user mangement model popular in many IT systems. VersionInfo - An instance of this class allows to attach versioning information to ideas. complements - Indicates ideas that complete each other (e.g. one idea supplementing a solution ommited by the other but necessary for implementation). currentVersion - Property used for idea versioning, indicates that the object describes the most up to date version of an idea. describesPartOf - Indicates that an idea incudes a description of what has been proposed in another idea but they might not have been merged. For example: single complex idea describes improving a laptop model and can include ideas about new keyboard, new screen that are submitted also as seperate ideas by other users. describesRelatedObject - Points to an idea that describes innovation for a different object or topic but somehow related to the current one (e.g. one object being part of the other, objects in offering of the same company branch, objects of similar use etc.). describesSameObject - Points to an idea that describes innovation for the same object or topic. details - Indicates that the currently described idea presents a more detailed description of another idea or its element. endDate - Indicates end date of an event. excludes - Indicates ideas that exclude each others implementation, i.e. implementing one of those ideas makes the other impossible to apply (e.g. contradictory ideas, where one proposes addition of particular feature while the other advocates its absence). extends - Indicates that the current idea is an extension to some other idea (e.g. adds some new concepts or proposes to do some innovative thing in a different way). firstName - First name of a user. follows - Indicates that the implementation of this idea should follow some other idea (i.e. the some other idea is a requirement for implementation of the described one). fullname - Users full name. Depending on the culture/nationality can be more then just a joint of gi2mo:firstName+gi2mo:lastName. generalizes - Indicates that the currently described idea presents a more broad perspective than some other idea and encapsulates it on a more generic level. hasAccessControl - Property indicating an Idea/idea contest having certain collaborations permissions (e.g. public, private, editable for all etc). In case of Idea Contests this propery can be used to indicate who can take part in the competition. hasAccessRight - Indicates that access control list describes privilages for a certain type of access right. hasAttachment - Property indicating an Idea having an Attachment. hasCategory - Property indicating the category of idea or a review. hasComment - Property indicating an idea or other entity having a comment. hasCreator - Property indicating an idea being created by a certain User. hasDescription - This property indicates that an idea or another entity of the Idea Management systems (e.g. idea contest) has a more broad description then just the standard summary (e.g. idea benefits or idea contest requirements). hasDuplicate - Indicates identical ideas. hasIdea - Indicates an idea that was posted inside a particular Idea Management System instance. hasIdeaContest - Property indicating an idea being part of a Idea Contest or an Idea Contest being posted within an IdeaManagementSystem instance . hasEndpoint - Indicates the data entry endpoint of the submission method. This can be a web form URL, a web service address, a device URI etc. hasMember - Describes Access Contol List/ UserGroup having a certain member(s). hasMetric - Associates an idea or idea contest with a metric. hasNextVersion - If exists, this property points to an Idea Object that is the next version of the described idea. New version of an idea can introduce new relationship, new idea content, split authorship etc. hasNextVersionInfo - If exists, this property points to version information of idea created after the ones describe by this version. hasOrigin - Indicates that an idea origines (was created based on other) idea. hasPreviousVersion - If exists, this property points to an idea which is the previous version of the currently described one. Idea versioning can be used to indicate changes in idea relationships, extensions in idea content, or changes in authorship. hasPreviousVersionInfo - If exists, this property points to the previous version information of the same idea. - Describes relations between ideas and other resources, without specifying exact link type. hasSimilar - Indicates similar idea but not duplicates (e.g. idea about improving car appearance, and idea about car speed; both can mention new type of tires but also a number of different elements). hasStatus - Property indicating an Idea or IdeaContest have a given status. In case of ideas, this gives information about the position of the idea in the idea life cycle (e.g. newly submited idea, under review, implmented etc.). hasSubmissionMethod - Property indicating an Idea being created with a particular submission method or device (e.g. thought web CMS, via call phone etc). hasTag - Property indicating tag associated to the idea - a user created categorization of an idea. hasTag - Indicates that an idea has been tagged by a certain person at a certain point of time. The following property points to a class that describes an activity of tagging while gi2mo:hasTag points to a Tag itself. isAccessControlOf - Property indicating that access control list is attached to a certain resource (e.g. idea). In case of Idea Contests this propery can be used to indicate who can take part in the competition. isAccountOf - Indicates that account belongs to a particular person that has a foaf description. isAlternativeIdea - Indicates a completely different idea that in effect is impossible to implement together with this one (e.g. ideaA: add some element to an object, ideaB: remove an object entirely from the offering). isAlternativeSolution - Points to an idea that refers to the same object or topic, the same problem but solved in a different way (e.g. adding a new element to a product but in two completely different ways that exlude each other implementation). isAttachementOf - Property indicating an attachment being associated to an idea/idea contest. isCategoryOf - Property indicating the idea that a category characterises a particular entity in the Idea Management System. isCommentOf - Property indicating an comment being attached to a certain resource. isCreatorOf - Property indicating that User is an author of a certain resource. isDescribedPartiallyBy - Indicates that an idea (as a whole) is described in the text of another idea. For example: single complex idea describes improving a laptop model and can include ideas about new keyboard, new screen that are also submitted as seperate ideas by other users. isDescriptionOf - This property indicates that the description is attached to a certain idea or another resource in the Idea Management systems (e.g. idea contest). isDisjoint - Indicates that two ideas are not related to each other in any way. isDuplicateOf - Indicates that an idea has been marked as duplicating the content of some other. This property can be used to distinguish between ideas that do not duplicate each other (i.e. not identical) but only one idea copying content of the other (and not the other way around). isEditorOf - Indicates that user has created (edited) a certain version of an idea. isExtendedBy - Indicates that the described idea is a subject of extension by some other idea (e.g. some other idea details the current one or adds some new point of view on the same topic). isIdeaContestOf - Indicates an idea that belongs to an idea contest; optionally a Contests being posted in a particular Idea Management System. isIdeaOf - Indicates an Idea Management System in which the idea has been posted. isImplementationOf - Describes that project is a result of previously submitted idea. isMentionedBy - This property can be used to link idea with any other entities that mention it (e.g. via links or citations). This can include both entities inside the Idea Management system, however also objects outside the system (e.g. Twitter comments, forums posts, blogs posts etc.). isMergedInto - Indicates an idea has been marged into a "master" idea. isOriginOf - Indicates that an idea was the base for creation of some other idea. isReviewOf - Indicates a review being assigned to an idea. isStatusOf - Indicates Status being assigned to a particular idea or idea contest. isSubmissionMethodOf - Indicates that a submission method has been used to create certain idea. isVersionOf - Indicates that version info is attached to a certain idea or other resource under version control. surname - Surname of a user. maxRatingValue - Defines maximal possible value for the rating. metricUnit - Identified in what kind of unit metric is defined (e.g. for money related metrics it can be currency: USD, EUR, for effort related metrics it can be KLOC etc.). minRatingValue - Defines minimal possible value for the rating. organizationPosition - Describes the occupation of the employee in the organisation. proceeds - Indicates that the described idea is a subject of extension by some other idea (e.g. some other idea details the current one or adds some new point of view on the same topic). ratingDownValue - Amount of times people voted down. ratingUpValue - Amount of times people voted up. startDate - Indicates starting date of an event. versionDate - Version creation or modification date. Accepted - Indicates an idea that has been accepted for implementation. Active - Indicates an idea contest is active and accepting idea submissions. AlreadyExists - Indicates that the following idea has been already implemented the moment it was submitted. Closed - Indicates an idea contest is closed, no loger accepting idea submissions and has been kept in the system for achival purposes and possible future reference. Deployed - Indicates an idea that has been implemented as a product and deployed on the market. Draft - Indicates an new idea submitted to the system. Implemented - Indicates an idea that was accepted and later implemented. PartialyImplemented - Indicates that an ideas has been accepted for implementation but only partially implemented. PendingReviews - Indicates that an idea contest is currently closed for submissions but the subbmited ideas have not recieved their reviews and their statuses may be subject of change. This status should be used when the idea contest organizers decie to close submissions and start review process to choose the winners of the competition. Rejected - Indicates an idea that has been rejected and shall not be implemented. UnderReview - Indicates an idea being under review. gi2mo:IdeaCategory renamed to gi2mo:Category to enable categorisation of more then just ideas.